What does a Trusted Financial Adviser do? A ‘Trusted Adviser’ will always put your best interests first. The most important first step is to gain an understanding of your values around money, then clarifying what your most important goals are. Then we move onto where you are financially and start to chart where you need to be. Definitely look at their professional qualifications and how long they have been advising clients in your area. Also in our view, someone who is not aligned with any product providers including banks or insurance companies. Do your homework; you want your Adviser to be your personal fiduciary. Imagine getting into a taxi and telling the driver you don’t know your destination and to just drive. There is a good chance you will not end up where you really wanted to be. Having a comprehensive financial plan is a roadmap directing your decisions around what is important to you about money. A robust financial plan will clearly identify your most important goals and objectives, then provide a number of strategies to achieve them. Some practical aspects may cover cashflow management, debt management and reduction, investment advice, asset allocation, personal insurance protection and estate planning issues. How much do you charge and what do I get? Initial Meeting fees are generally $330, however, if you have been referred to our firm from one of our clients or professional associates this meeting will be complimentary. Construction & Implementation of Statement of Advice. Should you decide to engage us to provide you with a comprehensive Statement of Advice, we will charge you a one-off fee which will be quoted to you in a detailed Terms of Engagement document. Lastly, our clients generally retain our firm to provide ongoing review and advice over many years. This fee will be disclosed in our Terms of Engagement so you can make an informed decision. If you would like more information please email us requesting a copy of our Financial Services Guide. You can choose to provide us with a clear understanding of your current position prior to our first meeting, or you can come in for the first meeting and get to know each other before deciding to provide personal information. This will most likely require a 2nd meeting so we can put together some concept ideas to outline the value we believe we may be able to provide. This second meeting is generally complimentary. Am I obligated to continue with Alman Partners after the first meeting? No. Hopefully you will leave this meeting more knowledgeable and with a clearer picture of what actions you must take. After the plan has been implemented, what happens next? Depending on the complexity of your situation, we will offer to meet you once or twice a year for a review of your portfolio. At these meetings, we will discuss your overall financial strategy, performance and product costs, all while ensuring we are targeting towards your goals. Should you have any queries or changes that occur to your situation outside of these meeting times, your Adviser is always available to discuss this with you. When do I need to update my Financial Adviser? It is always best to inform your Financial Adviser of any major changes to your financial situation. This way we can ensure that your financial plan is on track and you are in the best position to achieve your goals. It is best to update your Adviser when you have a change in employment, receive a large pay increase, receive an inheritance or pay out a loan. Do I need to come into the office for meetings? We understand that making a visit to our office is not always possible, especially when you do not live in Mackay. We cater for all meeting types – face to face, phone only (with any relevant documents posted or emailed) and web-based meetings. Yes. We have several free off-street car parks located behind our building. 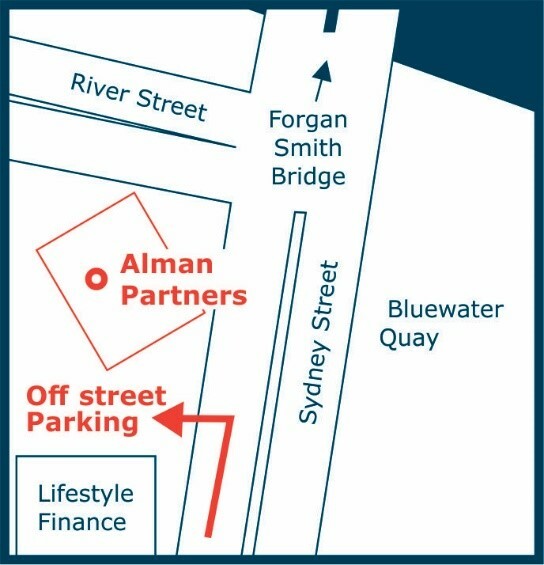 To access the carpark from Sydney Street, head towards the Forgan Smith bridge and turn left into the last driveway before turning onto River Street (between Bond Store & Customs House).